Live Birth in Aquatic Reptiles! This week, a [study] was published that unveiled an amazing new fossil from the Middle Triassic (247-237 million years ago) of South China. This fossil is of a pregnant archosauromorph. An archosauromorph is a reptile that’s closely related to archosaurs (crocodiles, birds, their ancestor and all of its descendants). So it’s not quite an archosaur, but it’s not more closely related to any other reptile. This particular archosauromorph is a very long necked Dinocephalosaurus. 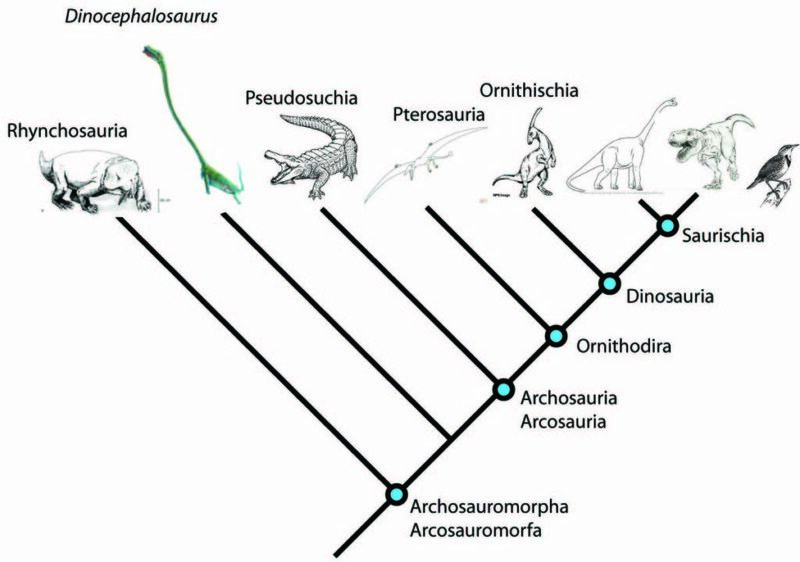 The Archosauromorpha family tree. Pictures from various online coloring books, Benton (1983) and Liu et al. (2017). This fossil is the first archosauromorph to show pregnancy. How do we know it was pregnant? Great question, and one that the authors had to answer. We know the baby is the same species as the adult because of the shape of the bones and the crazy long neck found in this species. We know the adult didn’t just die on top of a baby and get fossilized like that because the baby is completely inside the body outline of the adult. We know that the adult didn’t eat the baby because aquatic animals usually eat fish head first (as seen by a partially digested fish in the gut of the adult), and the baby is oriented the other way. The authors also note that the baby is curled up in a typical way for developing babies. Lastly, we know that this adult wasn’t on her way to lay an egg containing the baby because usually eggs are laid with a much less developed baby in them. There’s no evidence of eggshell around the baby either. Figure 3 from the paper showing the fossil on the left and the interpretation on the right. The baby is drawn in pink on the right. We know that crocodiles and birds (archosaurs) lay hard eggs and there aren’t any crocs or birds that give live birth. We have fossils of other reptiles (like ichthyosaurs, plesiosaurs, and mosasaurs), along with several living snakes and lizards that give live birth. This fossil is the first example of a close relative of archosaurs that do this. Figure 3c from the paper showing a reconstruction of the pregnant Dinocephalosaurus. This entry was posted in English and tagged Archosauromorpha, China, Dinocephalosaurus, Middle Triassic, Pregnancy. Bookmark the permalink.